Swedish energy giant Vattenfall has found a way to further cut the cost of grid-scale energy storage: share the infrastructure with a wind farm. The company has announced the commissioning of what it said was “the largest co-located battery installed in the United Kingdom” — a 22-megawatt plant, which shares electrical plans with the Pen y CyMoedd wind farm in Wales. Developers of many current and upcoming wind projects are studying energy storage as a way of earning extra revenue from arbitrage, by storing power until it can be sold for a higher price. But in Vattenfall’s case, the wind and battery plants will operate independently. The 76-turbine wind farm, which is Vattenfall’s largest onshore project and also the biggest in England and Wales, delivers up to 228 megawatts of power direct to the U.K. grid. 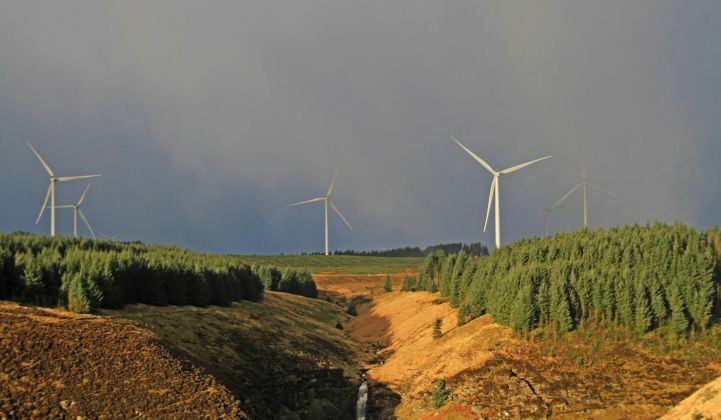 Pen y Cymoedd is capable of meeting the equivalent electricity needs of more than 13 percent of households in Wales and displaces an average of around 331,000 tons of carbon dioxide from fossil-fueled generation every year, said Vattenfall in a press release. The GBP £400 million ($532 million) project was officially opened in September 2017. The battery system, meanwhile, shares electrical infrastructure with the wind farm but earns its keep by delivering ancillary services, and specifically enhanced frequency response, to electricity network operator National Grid. The battery system is made up of six shipping-container-sized units, five of which house 500 i3 BMW-manufactured battery packs. Each of the new BMW lithium-ion batteries has a capacity of 33 kilowatt-hours and is adapted for stationary storage applications, Vattenfall said. In March last year, Vattenfall inked a deal with BMW Group for a supply of batteries originally destined for the i3 electric vehicle series. The energy company committed to buy 1,000 of the lithium-ion batteries. The first project to benefit from the deal was the 122-megawatt Princess Alexia onshore wind farm near Amsterdam in the Netherlands. Vattenfall added 3.2 megawatts of energy storage capacity to the site, making it the company’s first large battery project in the country. Vattenfall is also planning to co-locate a battery plant next to a Nordex wind farm in Hamburg-Bergedorf as part of a project called "Norddeutsche Energiewende NEW 4.0" with the Hamburg University of Applied Sciences. Other possible battery and wind co-location projects are under review in the Netherlands and the U.K., said Claus Wattendrup, head of Vattenfall’s solar and batteries business unit. Co-locating wind farms and batteries made economic sense, he told GTM. “We have the site, the grid connection, so there are cost savings,” he said. In the U.K., this allowed the company to offer lower bid prices for energy storage in the hotly contested enhanced frequency response market, he said. 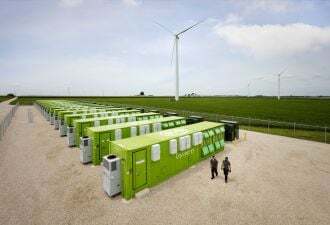 For now, it appears these facilities will use new batteries, although in 2016 Vattenfall said it was working with BMW and Bosch to reuse electric vehicle battery modules in stationary energy storage plants. The utility opened a test facility with 2,600 battery modules from more than 100 electric BMW cars in Hamburg’s harbor district. The plant, with 2.8 megawatt-hours and 2 megawatts of capacity, was used for frequency response services. Vattenfall is far from the only energy company moving toward the integration of storage with renewable generation. The wind turbine manufacturer Siemens Gamesa, for example, recently told GTM that hybrid systems incorporating solar and energy storage were a growing focus area. And in March Bay State Wind, a joint partnership between the Danish power company Ørsted and U.S. transmission builder Eversource, said it would work with NEC Energy Solutions to add batteries to an 800-megawatt offshore wind farm planned off the coast of Martha’s Vineyard. Bay State Wind ultimately lost the bid to another developer, Vinyard Wind. But given the apparent synergies between wind farms and battery plants, it is likely more co-located projects will appear in the near future. Join us at GTM Forum: Wind & Storage as we gather with experts from the energy storage and wind industries to examine technological and regulatory developments, business model innovations, and investments in resources.